From the award-winning author of Easter Island comes a powerful, "unputdownable" (Vogue.com) novel of love, loss, and redemption amid the ruins of war-torn Italy. 1943: When seventeen-year-old Juliet Dufresne receives a cryptic letter from her enlisted brother and then discovers that he's been reported missing in action, she lies about her age and travels to the front lines as an army nurse, determined to find him. Shy and awkward, Juliet is thrust into the bloody chaos of a field hospital, a sprawling encampment north of Rome where she forges new friendships and is increasingly consumed by the plight of her patients. One in particular, Christopher Barnaby, a deserter awaiting court martial, may hold the answer to her brother's whereabouts--but the trauma of war has left him catatonic. Racing against the clock, Juliet works with an enigmatic young psychiatrist, Dr. Henry Willard, to break Barnaby's silence before the authorities take him away. Plunged into the horrifying depths of one man's memories of combat, Juliet and Willard together plumb the moral nuances of a so-called "just war" and face the dangers of their own deepening emotional connection. In vibrant, arresting prose, Vanderbes tells the story of one girl's fierce determination to find her brother as she comes of age in a time of unrelenting violence. 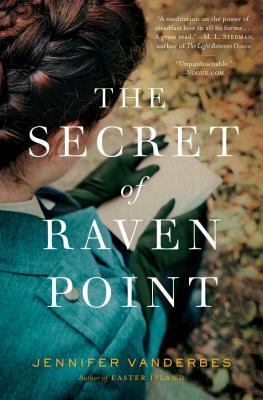 An unforgettable war saga that captures the experiences of soldiers long after the battles have ended, The Secret of Raven Point is heartbreaking, and ultimately uplifting: "The only disappointing thing about this book is that it has to end" (Library Journal, starred review).